Spices have been used in food and drinks since ancient times for different purposes but only recently have scientists begun to explain the herbal and medicinal effects of various spices. They are actually natural remedies for many health problems. Some of them are discussed here. Curcumin is the main active ingredient in turmeric. While turmeric was probably originally used dye in India about 2500 years ago, now it is one of the most widely used spices on the sub-continent. But turmeric offers more than rich color and unique flavor, it offers a number of health benefits, too! •	It is a natural antibacterial and antiseptic agent which is useful in cuts and burns. •	It speeds up wound healing and thus quickens skin repair. •	It is thought to prevent beast cancer from spreading to the lungs. •	If combined with cauliflower, it is believed to prevent prostate cancer. •	It reduces the risk of childhood leukemia. •	It acts as natural liver detoxifier. •	It prevents metastases of different cancers. •	It is a cox-2 inhibitor and natural painkiller. •	It has an anti-inflammatory effect. •	It increases fat metabolism and thus aids weight management. •	Traditional Chinese medicine uses turmeric to treat depression. •	Indonesia traditional healing uses turmeric to relieve menstrual cramps. 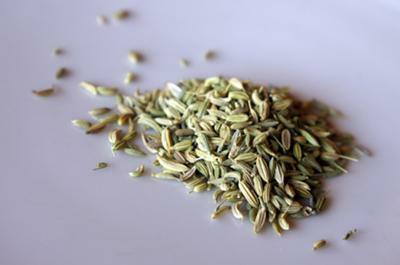 Fennel seeds are used in China primarily for their anti-venomous properties, but fennel’s health effects extend to protecting against different diseases and discomforts. •	It has anti-spasmodic and anti-inflammatory effects. •	It may protect against liver diseases and cancer. •	It calms upset stomach and promotes healthy digestion. •	It is rich in an anti-oxidant, vitamin C, and potassium. •	In nursing mothers, it can increase milk secretion. •	It helps in relieving menstrual cramps. •	During menopause, it regulates hormonal changes. Coriander seeds, from the cilantro plant, are noted for their anti-oxidants and numerous other health benefits as listed below. •	It helps in digestion and prevents flatulence. •	It protects against bacterial infections (Salmonella bacteria). •	As an anti-inflammatory, it alleviates symptoms of arthritis. •	It protects against urinary tract infections. •	It helps in relieving intestinal gas. •	It lowers LDL and raise HDL. •	It lowers blood sugar. •	It is a very powerful agent in the treatment of ovarian cancer. •	It is effective in the treatment of morning sickness. •	It can prevent colon cancer by slowing down the growth of cancer cells. •	It can control inflammation. •	It is a natural, powerful pain killer. •	It is effective in the prevention and treatment of the flu and colds. •	It stops the secretion of prostaglandins and thus provides relief from migraines. •	It reduces the risk of kidney damage. •	Ginger tea helps in reducing menstrual cramps. Though commonly used to add flavor to desserts or coffee, cinnamon offers far more than a rich taste. •	Its number one health benefit is in stabilizing blood glucose. •	It is used in the treatment of menstrual disorders like dysmenorrhoea, amenorrhoea, endometriosis etc. •	It treats carbuncles, abscesses and sores. •	It is effective in treatment of cough with phlegm. •	Poor blood circulation, cold limbs and deficiency sweating can be treated with cinnamon as it encourages blood flow and heats up the body. The above mentioned spices are no longer just for increasing flavor and palatability of foods, they have become recognized for their health enhancing and disease preventing properties, as well. Toffler Niemuth has certificates in both traditional Chinese and Indian (Ayurveda) medicine. She runs a natural and herbal products store and offers health coaching online. Toffler is a passionate wellness blogger who can be reached at WorldVitae.com. I know a lot about my spices, and yet I found new information in your post.